Any K-Beauty fan knows their Benton. I've reviewed their entire snail range here. Fast-acting healers for distressed skin, the lot. For K-Beauty newbies, Benton was inspired by the movie The Curious Case of Benjamin Button, where the protagonist grows younger with time. Benton aims to take your skin back in time, restoring it to peak condition. 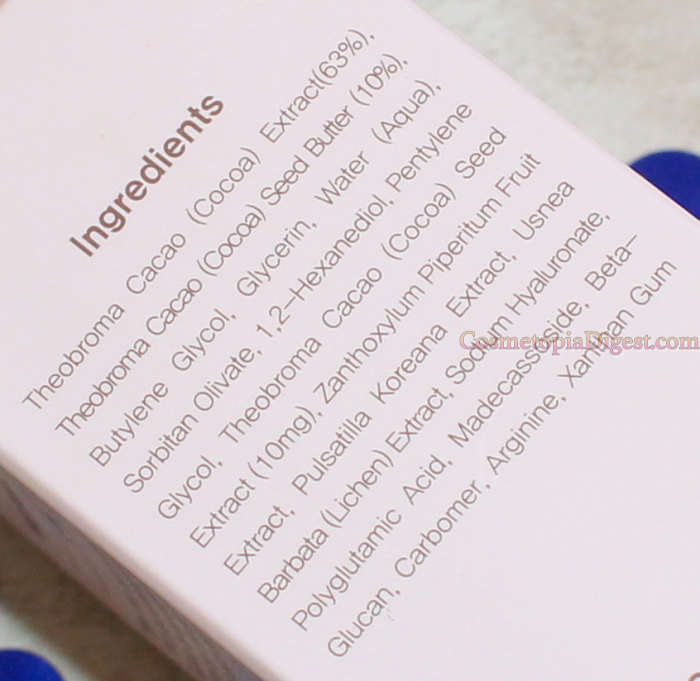 Recently, they launched a Cacao Moist and Mild Cream for the face. It is fragrance-, alcohol-, and colouring-free. A bit of trivia for you: Cocoa's scientific name comes from Theo (God) and broma (food). What woman is not going to agree that cocoa is the food of the gods? Scroll down for more on the Benton Cacao Moist And Mild Cream. The packaging reminds me of Mizon's Snail Repair Gel Cream. Incidentally, both can be used at the same stage in a multi-step skincare routine. However, the Benton cream is lighter and wetter, while Mizon is clear and jelly-like. The pH of the Benton Cacao Moist and Mild Cream is 6. 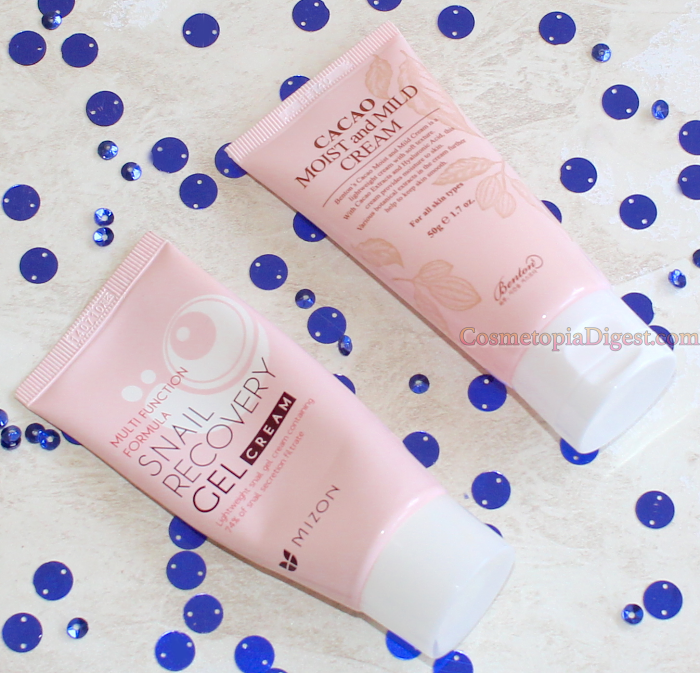 Mizon's Snail Recovery Gel Cream is 5.5. Those familiar with Benton's Snail Bee range know that the brand is all about high percentages of key ingredients. No exception here. The Cacao Moist and Mild Cream contains a whopping 63% cocoa extract, which is very rich in polyphenols. It also contains 10% cocoa seed butter. Generous proportions. The polyphenols in the cocoa extra act as antioxidants, while the cocoa seed butter contains fatty acids such as palmaitic, stearic and oleic acids. Not much to worry about there - ingredient watchdog CosDNA has only flagged the cacao seed butter. If you are fine with using ingredients such as shea butter, this is not going to be a problem. Benton says they never use alcohol, which dries the skin. They also avoid parabens, mineral oils, benzophenone, steroids, and chemical preservatives. So what does the cream do? It is, as the name says, a lightweight, summer-friendly cream which gives a dewy glow and helps the skin retain moisture levels (thanks to the hyaluronic acid). This being a lightweight cream without occlusive ingredients, I like to layer it. If you are particularly breakout-prone, or prefer lighter moisturising, you can use this as the standalone hydrating step in your skincare routine. I use a facial oil or a sleeping mask on top. Contrary to my expectations, the cream does not smell like chocolate - it has no smell at all! It is a thin white gel which spreads very easily and is absorbed within a minute or so. When it is absorbed, it does not dry matte, but leaves the - oily, in my case - skin dewy. You can apply this cream around the eye area as well, for extra hydration. I love layering my eye creams, a lot of what I apply on my skin - with the exception of cleansers, actives, and milia-causing occlusives - goes on the under-eye area as well. This can be used as a standalone moisturiser, or layered. Add an occlusive or a thicker emollient, and I'm done hydrating my skin for the night. Looking for an affordable summer moisturiser? Look no further. Looking for a light layer you can slip between the serum and a thicker occlusive? This is the one. I'm going to repurchase mine from W2 Beauty. The Cacao Moist and Mild Cream is a lovelier choice than the Snail Bee Steam Cream from Benton - the latter is more thick and occlusive, and you cannot use a facial oil on top. It is a lightweight choice for acne-prone skin. I would love to see more in this range from Benton - a Cacao essence, and a serum, and maybe a cleanser. My only gripe is, this doesn't actually smell of cocoa. That would have been the icing on the cake. Imagine going to bed smelling of cocoa. 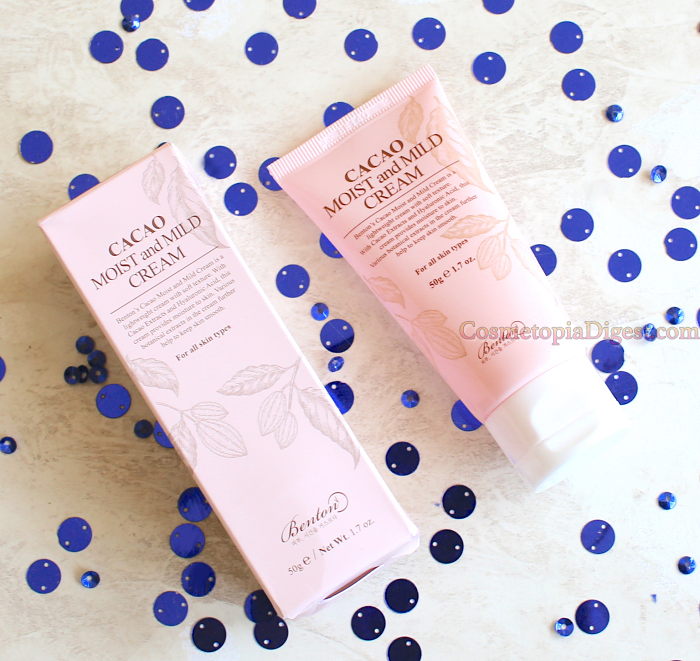 The Benton Cacao Moist and Mild Cream costs just $11.20 (for 50ml) on W2Beauty - discounted from an MRP of $16. StyleKorean also offers it at the same price. Both ship worldwide tracked.